Every electronic dartboard needs to have plenty of games, work well and most of all, provide endless hours of fun. These are the things we took into consideration when selecting the best electronic dart board. If you want to skip the reading, the Cricket Pro 800 Electronic Dartboard by Arachnid scored high marks in all categories and is our top pick. Electronic dartboards are the latest and greatest in the sport of darts, and you’ll find that must pubs and bars today have traded in their traditional boards for the electronic version. This new style of board is so great because it takes away the need to write down scores, and also takes into account various handicaps of the players involved. You’ll find that electronic boards come in a number of different sizes, colors, and styles, but if you want to practice your game at home then it’s best to go with a standard size. With so many electronic dartboards to choose from, you may feel daunted when it comes to finding the right board for you. Take heart, because finding the right one is easier than you think. The electronic dartboards that we discuss below are the top rated on the market, and our buyer’s guide takes it one step further by discussing the interesting history of this wonderful game. With the Cricket Pro from Arachnid, a built in computer helps to keep the game moving. You can enjoy a whole host of features that allow you to establish player handicaps so that beginner and advanced players can compete with one another on an equal playing field. Also, with the micro thin segment dividers, you have reduced bounce-out. 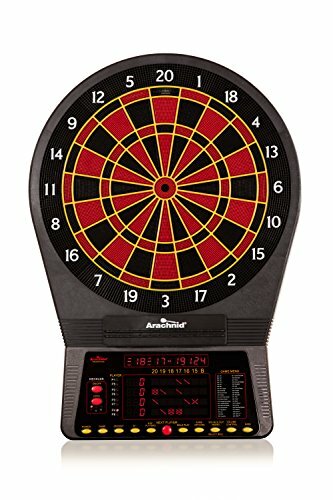 What this does is increase the scoring potential on the board, making you feel like more of a winner, while preventing you from having to search for darts on the floor. With this kind of improved player performance, you get the best possible playing experience that the whole family can enjoy. The overall durability of this board is enhanced by the Nylon Tough segments, exclusive to Arachnid boards. These have proven to offer fantastic strength through the years of abuse that a dartboard will take. They maintain their shape over time, and also create a quieter game than with traditional materials. All in all, this dartboard is packed with features and accessories, such as extra dart tips, 6 soft tip darts, AC adapter, game instructions, mounting hardware, operating manual, and so much more. Enjoy the convenience and fun of owning an electronic dartboard in your home. If you would like to see all of the features of the Arachnid 800 take a look at the video below from DMI Sports. 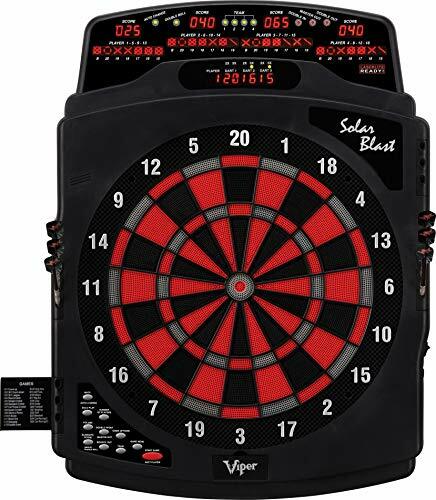 The Viper Solar Blast is one of the top rated electronic dartboards on the market, and also one of the best models that Viper makes. This dartboard set features a fantastic 15.5” target area and 42 games to choose from, with 307 level variations. You get two dart sets and extra tips, and when you operate solo play you can practice on your own.The whole set comes with built-in dart holders and 2 sets of soft-tip darts to get you started. This dartboard is the perfect addition to your game room. Built from durable materials, and with a appealing finish that will contribute to your decor, you’re going to love having this electronic dartboard around for a night with the guys, a fun family match, or for birthdays and events. Easy to use and operate, everyone from beginner to advanced is going to have a good time playing with this board, and it’s constructed in such a way that it is sure to last you for years to come. Made from commercial grade nylon that is target tested, this board from Arachnid is designed to entertain a variable number of players at the same time. In fact, anywhere from one to 8. This high quality, top rated electronic dartboard features a stunning illuminated LED display that is easy to read from the throw line, and it provides a handy voice prompt that lets you know when the next player is up. It also features easy dart removal so that it’s helpful to keep the game moving. There are 24 games overall, and 132 variations. The Arachnid Cricket Pro 650 also comes with six darts and a handy operating manual is included. This electronic dartboard is definitely built to last, and is backed by a one year warranty. Some other fantastic features that you’ll find on the Arachnid include auto player ranking, quick play buttons for cricket, a regulation sized 15.5 inch target face, concave segment holes, and so much more. All in all, this is a top rated electronic dartboard for very good reason. Enjoy the fun and excitement of owning a board of such high quality in your home. You’re going to see that every member of your family is going to enjoy playing, and will find this board easy to use. The top rated electronic dartboards are consistently favored by customers because they offer a perfect board for gaming, while still providing special features that traditional boards do not have. You can be confident that when you purchase one of these electronic dartboards you’re getting a product that you can really trust, constructed of durable materials easy to use and operate. All of these electronic dartboards have proven that they are affordable for most consumers, and come in standard sizes that are professional in quality. When you’re ready to own one of these electronic dartboards, then it’s time to purchase with confidence. If, however, you’re interested in learning more about dartboards and perhaps getting something different, then consult the following buyer’s guide to learn everything that you need to know. Owning a dartboard in your home or place of business is a fantastic way to enjoy the game at your convenience. If you find that you want the fun of playing darts to last well after you leave the pub, then you’re definitely a fantastic candidate for bringing one of these boards into your home. So now lets learn a bit more about this wonderful game that has been around for centuries. You may be surprised by its origins. The dart board was invented in 1896 by Brian Gamlin. There are literally hundreds of styles of dartboard out there, with anything from the more tradition, vintage-style, to the newer electronic versions. There are also regulation-sized boards, game-sized boards for children, and small boards for taking on the go. No matter how you’re going to be using your board, it’s smart to know about the different types of boards that are out there so you can make the most informed decision. In this buyer’s guide, we’ll explore everything that you need to know, and what features you definitely want to look out for. It is said that dartboards were originally crafted from upside down wine barrels and the game itself is derived from archery. When wine barrels were in short supply, players would use a ring cut from a tree. The sport was thought to be invented in Medieval England, and is still wildly popular today around the world. What made it so popular then, and today, is that regardless of class or status in society, everyone found the game amusing, especially when played while drinking. Traditionally an Anglo-American sport, in the Victorian Era it spread globally thanks to the British Empire. Then around 1900, the rules of darts changed into something more like what we see today. Finally in the 1970s, the international throwing line was established at 7 feet 9.25 inches. Before this the line was set anywhere between 7.5 feet and 8 feet. When the rules of darts were standardized, so were the components of the game. A board must be hung so that the bullseye is 5 feet 8 inches from the floor. That means the height is eye level for a person who is 6 feet tall. Dartboards for children are larger in size and are therefore not regulation. This kind of board is intended just for fun, and not competition. There is no end to the kinds of boards that you can find. You can have a board customized with your favorite colors, you can have your name engraved, or you can link scoring to your electronic devices. For every player’s needs, there is guaranteed to be a board, and that’s why finding the right board can seem daunting. Customized Boards: You’ll find many stores that sell customized dartboards, and you can get yours monogramed with your initials, have photos screened onto the surface of the board, and you can add embellishments to the exterior casing. You’ll find also that several sports teams have their own dartboard logo, and this will include team mascot, team colors, and sometimes specific players. Even NASCAR has several options for dartboards which pay homage to great drivers throughout history. And, since darts began in pubs and bars, the game is stilled played in these locations, and therefore many boards are sponsored by beer and alcohol companies. Bristle Dartboards: For regulation and competition purposes, the surface of the dartboard is very important. You’ll find that bristle dartboards are usually regulation sized and durable enough for professional use. They use staple-free thin wires which prevent bounce outs when the dart hits in an awkward way. They are also self-healing boards, which means that they feature sisal fibers. Also, each ring has a number which denotes the points earned for each shot. Bristle dart boards will also allow the user to remove the numbers if they create too much glare on the playing surface. Magnetic Dartboards: Magnetic dartboards offer a safe playing alternative because there are no sharp tips to injure onlookers. The board is flexible in nature and covered in cloth to protect the wall behind it. It’s also easy to store this kind of dartboard. Most sets will include six magnetic, flat-tipped darts, and additional projectiles can be purchased separately. You’ll find with dartboards that roll up that there’s a bullseye game on the back of the board for a second gaming opportunity. Electronic Dartboard: As this is a buyer’s guide for electronic dartboards, we need to emphasize here that these are the latest and greatest in the sport. They’re a revolution in the history of the game, as players no longer need to keep score manually with the computer mechanism that is involved. You’ll find that the screen on advanced electronic dartboards will scroll and will allow you to put in your personal handicap. Also, these advanced boards have a cyber-play option that will link players who have similar boards but aren’t in the same vicinity. When you forget to turn the board off there is an auto-sleep mode that shuts the unit off on its own. Just like writing a score on a chalkboard, the unit allows you to delete the last score. 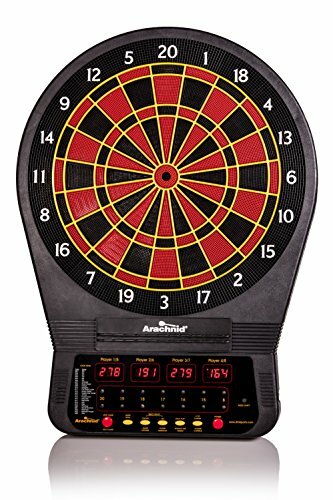 If the next player doesn’t land a dart on the board then there’s a missed dart catch ring below the board that will record this. Along with all these great advantages of owning an electronic dartboard, they usually have storage drawers so that darts are less likely to be lost. Children’s Dartboards: You can get these in a variety of colors and sizes, and they are intended to increase your child’s hand-eye coordination. Boards that are designed for children are usually flexible and soft, so if your child trips and falls on the board, there will be minimal damage. Owning an electronic dartboard is a fun and exciting addition to your game room, and everyone in the family can enjoy the sport. Darts have a long and rich history, and only in the last couple of years have electronic dartboards become so phenomenally popular. They’re a great alternative to the traditional dartboard because they eliminate the need to keep score by hand, feature less bounce out, and allow you to even play against people who aren’t in the room with you. Most electronic dartboards are easy to install, and come with many extra features that make gaming more enjoyable and easier than ever. In this article we began by discussing the top rated dartboards on the market, and these are the electronic versions that customers absolutely love. They are affordable to own, and easy to install in your home. These boards even allow you to input your handicap so that people of various skill levels can play against one another. In our buyer’s guide we discussed the rich and interesting history of darts, and talked about all the various kinds of board that are out there. If you’re thinking that an electronic board is right for you, then one of the top rated models is a great place to start. But if you’re looking for something more traditional, or something for a child, then consult the buyer’s guide to help you select one of these other styles of board. No matter what kind of dartboard you choose, you’re going to find that owning one in the comfort of your home is a great way to get everyone in on the fun.